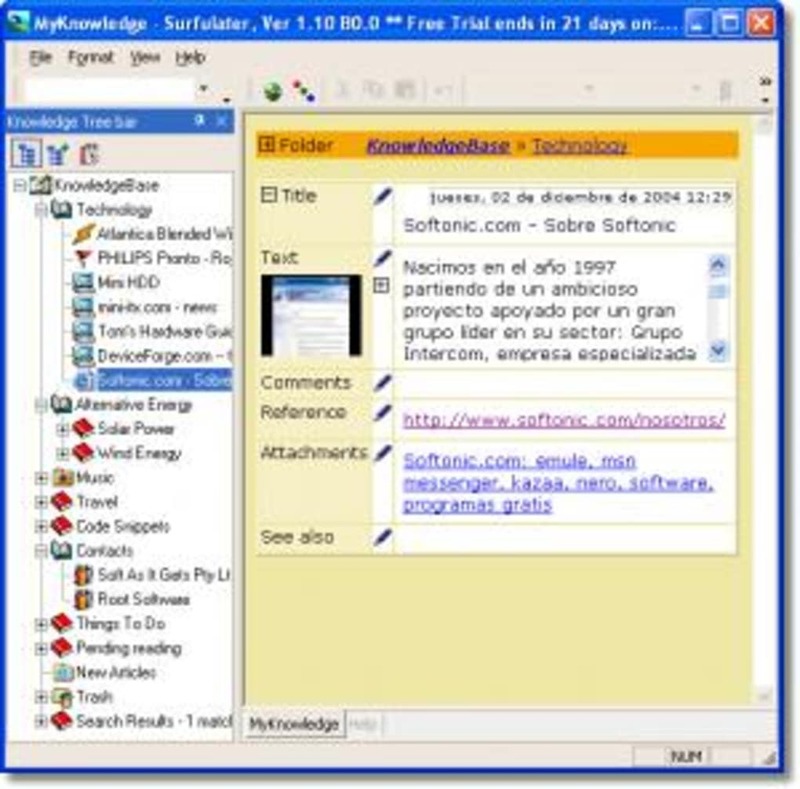 Surfulater is a powerful, trial version Windows program, being part of the category Productivity software with subcategory Databases. The current version of the program is 2.00.30 and it has been updated on 6/20/2007. It's available for users with the operating system Windows 98 and previous versions, and you can download it only in English.Since the program was added to our catalog in 2006, it has obtained 2,247 downloads, and last week it achieved 0 downloads.About the download, Surfulater is a light software that requires less space than most programs in the section Productivity software. Surfulater enables you to save anything you see on the Internet as well as any other important information that you need to permanently keep. You can use it as a general purpose information manager, a powerful research tool and research organizer, and as a knowledge base to build your own digital library of information. On the Internet Surfulater lets you capture rich HTML text and images from web pages and save web pages in their entirety. It automatically captures the web page address (URL), the page Title, a thumbnail image of Web page and Meta information. Your information can be edited using Surfulater's built-in HTML editor. Articles can be linked together to build a web of related information and notes can be added to make content even more valuable. Surfulater stores all of your information in a free from Knowledge Tree. You can create an unlimited number of folders to hold information and Surfulater solves the age old problem of which folder is best to use, by letting you store the same article in as many folders as you want. This capability combined with the ability to link articles together makes it much easier to categorize, organize and manage your information. There is little point storing information if you can't easily find it again. Surfulater's full text search engine quickly and effortlessly finds information. Information can be shared with your colleagues via Surfulater's built-in E-mail capability or saved as HTML or MHT and files and passed around. Surfulater's knowledge base (database) is completely contained in just two files, making it easy to carry around with you on a USB Flash Drive, or move between PC's i.e. work and home. What do you think about Surfulater? Do you recommend it? Why?